Hi, this is my third post on RichFaces 4. I’d like you to download the source code for this article and run it yourself (I run it on JBoss 6.0.0.Final). It does nothing very fancy, but it demonstrates a few RichFaces 4 components, and JSF 2.0 (that is, CDI, new annotations, Internationalization and more). Below, highlights of the sample app. rich:accordion is a very simple component that allows you to have collapsible panels (and only one is open at a time). Here’s a modal pop-up panel. You need to close it before all other page elements become accessible. And now a dataTable. 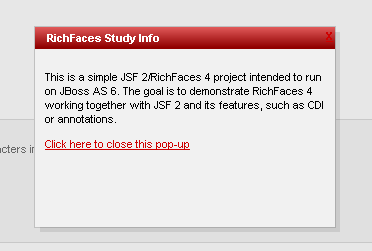 This is a fairly sophisticated component and you can see more if you browse RichFaces 4 showcase. As you can see, it allows you to filter data (and it’s AJAX based). One thing you must take into account is that if focus is in the filter field and the Enter key is pressed - it will submit the form. I don’t think that’s the desired behavior, so I put a hack in there (onkeypress). I reported this as a bug and we’ll see what they answer. This is not RichFaces 4 dependent, but since it’s used in the code above, I will demonstrate how it works. I have the following declaration in my faces-config.xml. Then I can use it on my pages. Don’t forget to download the source code for this article.